Delicious sweet potato dinner rolls you can use as sandwich rolls also. How was your July 4th Weekend, we spent with some shopping, and venturing outside to a park. We were not gone to see the firework show as traffic and parking is big concern. I was little worried that my kiddos won’t get some chance to see the fireworks. But around 11P.M there were some fire work display near house, we can see them from our front door, which my daughter greatly enjoyed, where as my little guy was bit afraid. On that evening I also made some sweet potato dinner rolls. I had earlier made sweet potato loaf with my sourdough, and have not tried with commercial yeast. I am part of Facebook group called Home baker’s guild where there is series called Blogger Tuesday Series featuring recipes and introducing particular blogger. For that I need a recipe to share. As most of the members of that group are from India that part of world Tuesday comes earlier than here, so I am posting the recipe on our Monday. For making this dinner rolls you need sweet potato puree. My hubby read in Google that for diabetes sweet potato are good. However he didn’t realize that boiled or mashed sweet potatoes, for instance, are not recommended as they are digested faster, thus increasing their glycemic index and possibly causing blood sugar levels to spike. Similar to fiber, fat will slow the rate of digestion and therefore maintain the low glycemic index, so a cooking method for sweet potatoes that is good for diabetics is sautéing in oil with the skins on. So his sweet potato experiment left with me with a boiled sweet potato. I decide to make use that for bread. Since he is diabetic, I made a whole wheat dinner rolls however, I didn’t add entire whole wheat flour to the bread. I found that for any sweet potato bread, you need to add only 7 ounce/200g of sweet potato puree is needed for about 12 ounce /340g of flour. I added little more flour. On the day of baking add mashed sweet potato, I didn’t make it puree, you can if you want uniform texture to flours, egg, and milk powder and form an sticky but smooth dough with water. Set aside for doubling once it is doubled in volume, divide the dough into 10 equal sized balls and set aside for second proofing. When it is doubled again, do an eggwash and sprinkle seeds of your choice I used sesame seed, also used 1 tablespoon of sugar, if you want you can increase your favorite sweetener. Since I made with instant yeast it doesn’t require any proofing.If you use active dry yeast make sure of proof before adding to flour. These dinner rolls are really soft and fluffy, make a sandwich or just slather some butter and toast and enjoy, option are endless. Here comes the recipe. 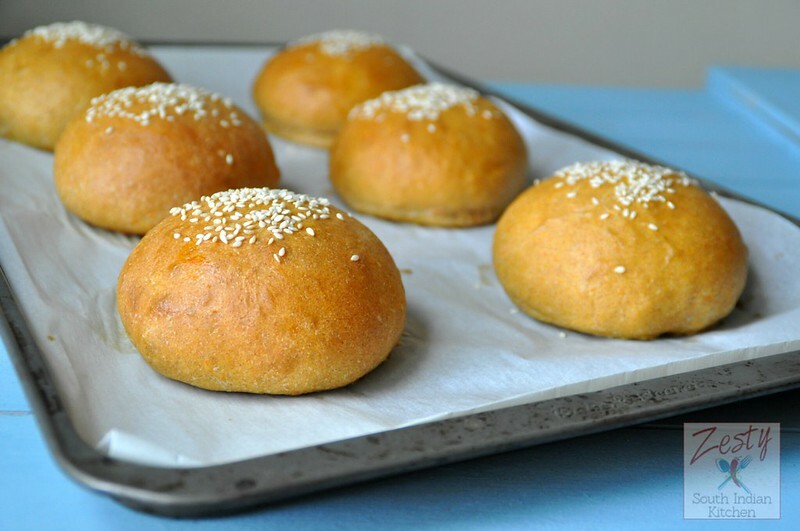 Delicious soft sweet potato dinner rolls made with whole wheat flour. Place all of the ingredients into the bowl of your mixer . Mix until you've form a soft, but not sticky dough. After the first rise, deflate the dough and divide it into 10 pieces. You can roll each piece(92g) into a ball, then flatten it to make it 3/4-inch thick (this give it a large enough diameter to fit your sandwich on after baking). Place the rolls either in a hamburger bun pan or on a lightly greased or parchment-lined baking sheet. Cover with greased plastic wrap, and let rise for 25 to 30 minutes, until almost doubled. 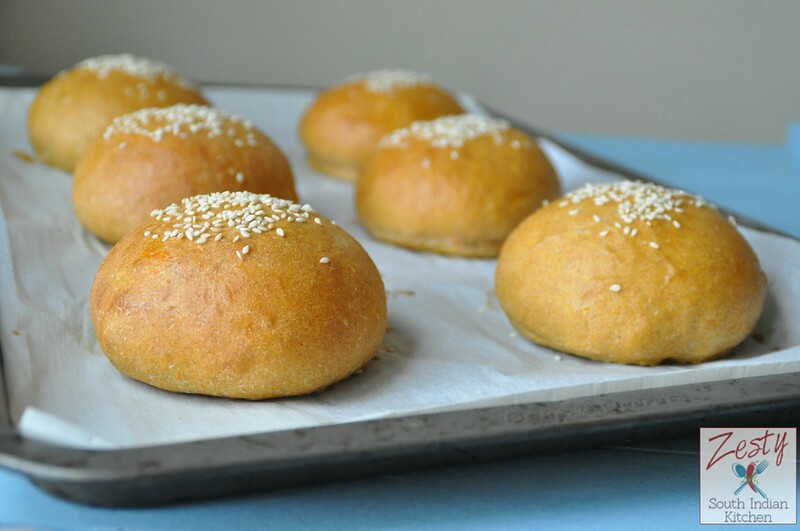 Brush the tops of the rolls with the beaten egg, and sprinkle with sesame seeds, if using. Bake in a preheated 375°F/190.5C oven for 19 minutes, until the tops are a rich golden brown color, and the centers read above 190°F when measured with an instant-read thermometer. Remove the rolls from the oven and cool on a rack for 5 minutes, before removing from the pan and returning to the rack to cool completely. These rolls look just PERFECT !! 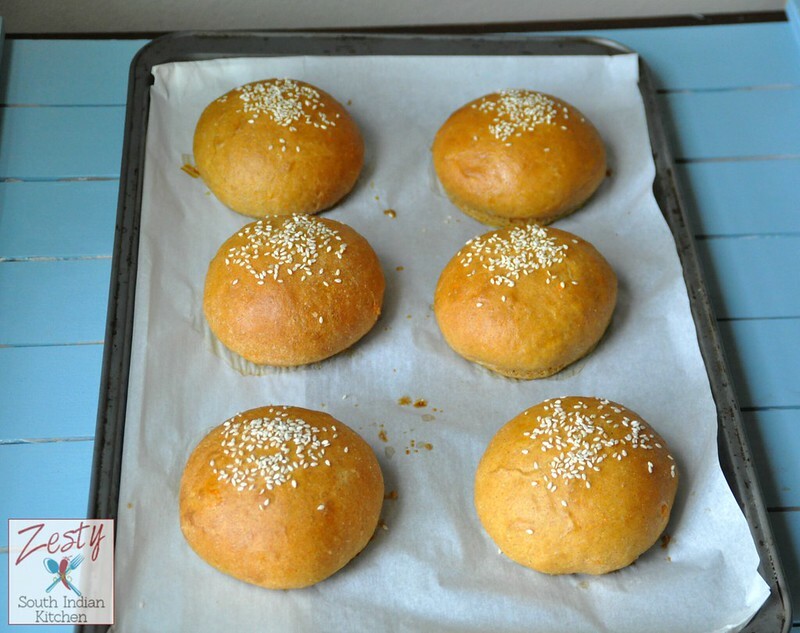 I am loving these buns Swathi….Yum yum yummy in my style.. Thanks a lot for this marvellous recipe and all the tips you give for diabetic people. Here in Valencia we usually use sweet potato for desserts, specially at Christmas time. I’ll give your rolls a try. Cheers from a very hot Valencia. 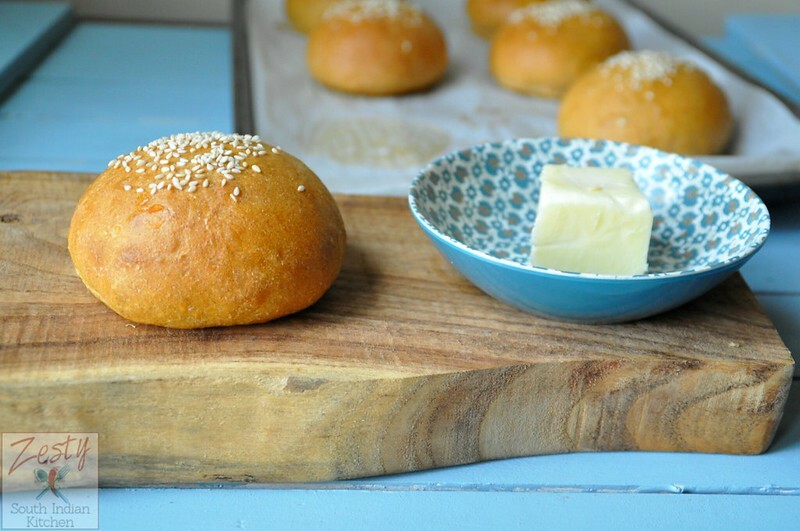 I don’t bake but this is a great way to incorporate sweet potato in dinner rolls. Sweet potato buns must be so delicious,Never heard about pureeying of potatoes,thanks for the info swathi. These Potato buns have been beautifully baked, delicious too! These dinner rolls look Soft and delicious..
very soft and yummy!! professionally made!! Swathi, I make a LOT of bread, but I’ve never made any bread or rolls with sweet potatoes. Can’t wait to try these! These look delicious Swathi and are on my list to do! You make the most wonderful breads Swathi! Absolutely Love this rolls! So lovely!